Today I prepared a meal of leftovers from our Christmas dinner and an Indian-Chinese fried rice meal. After I ate I went to rinse the bowl of the orange colored turmeric residue stuck to it, and it occurred to me what a waste it is to rinse even these minute remnants of health down the drain. What if our domiciles were engineered to recycle all waste streams, whether on-site with gray water and kitchen scraps, locally in the community for items like paper and yard waste, or in the case of plastics, metals and such, on a regional level. If our ability to cycle even small amounts of nutrients on-site goes up, then we keep more vitality local, and by using the (waste) nutrients from our wash water to grow more food for ourselves, and cycle those nutrients as much as possible, we reduce the long distance food hauling fuel footprint as well. Each time we cycle the nutrients on-site, we are keeping fertility for our benefit, reducing fertilization costs to us, as well as stretching commercially mined fertilizers and minerals further, giving future generations more time to improve the nutrient cycling even further. To be truly effective, the waste recovery process needs to start as close as possible to the usage source. The sooner we can intercept waste reclamation, the easier it will be to do so. So, not only would we be able to recycle nutrients, but also vital resources such as water. By recycling both nutrients and water on-site, say by using the wash water from the kitchen sink to fertigate food plants, we also reduce our potable water needs keeping us from depleting fresh water resources, especially aquifers that are depleting at alarming rates. Our ultimate goal should be leaving this world in the same or better shape than we found it – so, if I get a chance to build a new home, I plan on designing in as many resource capturing means as possible. Once again it has been some time since my last post. The wife and I have been very busy, but yesterday we managed to spend a little time at the Red Rooster Antique mall. We like to peruse the old stuff and while there I found three cookbooks that intrigued me. It is the only one of the three that has an ISBN number, and registered with the US Library of Congress, first published in 1976, last edition in 1980. It is written by Mennonites who are concerned about taking care of the hungry. I plan on writing an extended review of the cookbook at a later date. 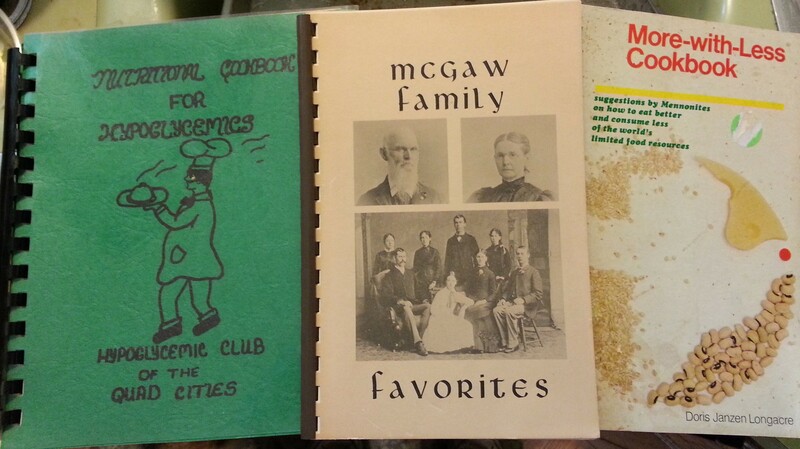 The second cookbook is the green one on the left, it is supposedly recipes for hypoglycemics. Titled “Nutritional Cookbook for Hypoglycemics” by the Hypoglycemic Club of the Quad Cities. Same with this one, I will write about later. The last one, in the middle, may turn out to be a great find. The “McGaw Family Favorites” depicts the family, Samuel Pressely McGaw (b.1827), wife Elizabeth Porter Leslie (b.1832), and kids born from 1852 to 1871. The recipe collection was compiled in 1975, so I am not sure how authentic these recipes are, one for sure isn’t old as it calls for a packets of Lipton Onion Soup mix! However, some of the other recipes look like they could be from the mid to late 1800s. I have bought a lot of older cookbooks over the last few months, and I plan on eventually blog about all of them, and I hope to make a few of the recipes one of these days, and I will try my best to make a post to this blog with pictures and what my families opinion is of each recipe. So, Friday, 19 June 2015, I went in for my heart check. They prepped me, rolled me in, and I was back out about 4 hours after I arrived at the heart hospital. Turns out, I am fine, the suspected blockage is only a little plaque build-up, which according to the cardiologist is unusual for someone my age, and yet again he wants me to be on a statin, but I refused once more and stated renal (kidney) failure in my mom being my concern. He didn’t argue with me but asked if I wanted to try a different statin than Crestor, but I said no thank you i want to try to manage this through diet and exercise. So, my next step will be to get back with Dr. Lewis in Texas and have him schedule the LabCorp tests he wants to run so he can prescribe his protocol to take care of my issue. Last week I updated you about my “heart condition” my cardiologist warned me about. So, this last Friday I went to the cardiology lab and they performed a heart cath where they went in through my wrist, through my arm artery with a probe, and looked at the “affected” area. Turns out I don’t have a blockage, I didn’t need a stent, but there is in fact some plaque buildup that is unusual for someone my age, so it still concerns my doctor and he still wants me on a statin. That is not going to happen, of course, but I will make him happy and say I will take it, but I will pursue alternative means of cleaning up my cardiovascular system using the protocols Dr. Lewis from [insert company name here] in Texas has developed. Anyway, I just wanted t post this update that I am in better shape than my doctor thought, and to reiterate that the current medical system is all about prescribing questionable medications to keep us paying for the physicians pharmaceutical payroll. I will post another update after I get to talk to Dr. Lewis. Well, a few weeks ago I had an incident where someone scared the crap out of me. The incident brought to surface a possible lingering health condition, namely, partial blockage in my heart from plaque, maybe. I was at my mother-in-law’s house just up the street, and as usual, if the 91 year old needs something fixed in or around the house, and no one else is available, I just walk over there if I am home, and see what I can do. That day I was headed home from a plugged toilet issue. The wind was gusting, and with the hearing damage from when I was in the Air Force, I could not hear a lot besides the wind blowing around my ears. Someone, to remain nameless, you know who you are, pulled up in their newish Ford F250 pickup to within a foot or two of me and beeped their horn. It wasn’t really a beep, more of a blast from a truck horn. Needless to say, it scared the crap out of me and my chest hurt for several hours after, and I had tight chest and trouble breathing for several hours. A few days later we went in to see a cardiologist who scheduled a heart stress test and blood work. The treadmill stress test is what turned up the suspected blockage in the heart. So, the doctor prescribed a statin, Crestor, but after reading some of the dangers of using statins, I have decided not to take it. I always knew statins were really not that effective anyways, and their benefits are based on flawed research. Why would you prescribe something like to someone that already has a heart condition that is not as critical as they made it out to believe? I have never been a fan of the pharmaceutical driven medical industry, but this is really leaving a sour taste in my mouth, and makes me be VERY suspicious of anything and everything spewing from the mouth of a conventional doctor or specialist. I will let them do the catheter probe of my heart to look at the suspected blockage area, but I refuse to take beta blockers and statins, we will just have to work around any issues that the lack of taking those poisons causes. These drugs/poisons are designed to make patients sicker, not better, so there is abso-frigging-lutely no way I am taking this crap. Period! Here lately I have not been getting the amount of sleep I need to be super alert and energized, and I have been reaching for coffee and caffeinated tea to give me a boost – a LOT lately. I also read two articles (1/2) of drinking water on an empty stomach first thing in the morning. These two are turning out to be a little bit of an internet exaggeration/hoax, the reason why I say that is because of this debunking, and here, but also I found this article on an Ayurvedic site, semi confirming water consumption in the morning. So for the last week or so I have been trying to drink one glass or 4-8 ounces (1/10 to 1/4 liter) water every morning. This seem to help with feeling parched, and on some days it made me feel better overall. I will need to increase this to two glasses over time, just to combat my typical American chronic dehydration. Then seeing the article about the Energizing Shower, I tried this today, and once again, I was surprised, but yes, I felt a little more energized. I really didn’t go THAT cold, but I turned the hot water way down, and I almost wanted to yelp in disgust of the cold water hitting my body. Did it wake me up? YES! Did it energize my body? YES, for the first hour or so after I felt very energetic. Now that I have had lunch, I am dragging again and having more coffee. I think there is a benefit to the shower trick, and I will continue to try to do it every day. Maybe by summer I will have a better feeling as to how effective this technique is. So, in the not too distant future I will be following up on this post and see how I am doing with this shower technique.